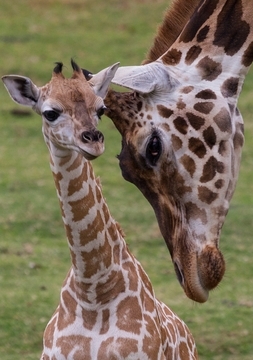 Six feet tall and weighing as much as 150 pounds at birth, the newborn giraffe (Giraffa camelopardalis) often stands within its first 20 minutes and is usually able to run by the end of its first day. The calf grows an inch a day at first, nearly doubles its height in its first year, and may ultimately reach about 18 feet. The giraffe is the tallest living animal on earth, and it has the longest tail of any land animal—growing to about 8 feet long, including the tuft.